cloudHQ is an excellent Chrome extension that allows you to sync and manage your cloud-based files right from Google Drive’s interface. We have tried syncing files from Evernote and Dropbox with Google Drive and it worked perfect. In the app’s official review description it mentions that it supports syncing between several other cloud services including Box, One Drive, Egnyte, SharePoint, and Google Gmail. You can easily move files from one service to the other with few clicks. And anything you add to a document, say in Dropbox or Evernote, is instantly reflected in the saved copy in Google Drive. Similarly, all changes done on a document on Google drive will show up in saved versions in other cloud services. 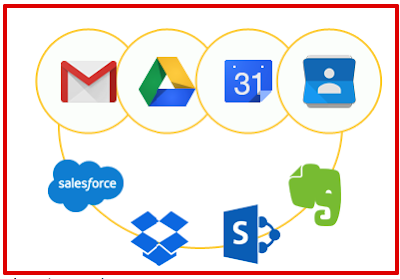 The strength of cloudHQ is that it lets you create a complete, centralized, real-time replica of all your cloud services and accounts to a central Google Drive account. This means that all the files, documents, notes and other data stored across different cloud apps are aggregated in one searchable central location. ‘cloudHQ admin can setup a shared location which is then shared with users of that service. For example, cloudHQ admin can create a shared Gmail label which a team can use to share and collaborate on important emails.You can also pick a service or account and create a "shared" folder, project or notebook. Invite others in a single step and they get to choose which service to use to synch the data.’ Check out cloudHQ website to learn more.